Computers can calculate perspective angles and create a drawing for us, but the spontaneity of mark making, the tactile quality of a writing surface, the weight of a drawing instrument, and the immediacy of the human touch are sensations that keep traditional drawing skills perpetually relevant. The sensuality and convenience of the hand persists and will survive as a valuable communication tool, as will the need to accurately express your ideas on paper. As a professional, understanding the foundations of drawing, how we process images, and how we interpret what we see are principal skills. Understanding linear perspective enables artists to accurately communicate their ideas on paper. 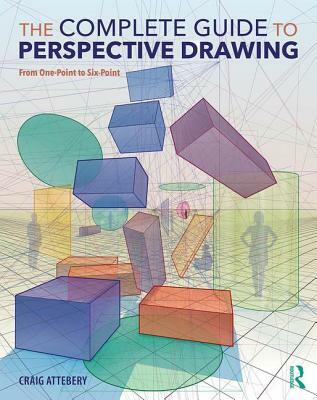 The Complete Guide to Perspective Drawing offers a step-by-step guide for the beginner as well as the advanced student on how to draw in one-point through six-point perspective and how to make scientifically accurate conceptual illustrations from simple to complex situations. Craig Attebery is a native southern Californian. He graduated from ArtCenter College of Design, USA, in 1980, receiving a BFA with Honors. He then completed his MFA studies at Otis/Parsons Art Institute, USA, in 1984. Craig has worked as a freelance illustrator for advertising agencies, science books, and the entertainment industry, as well as creating conceptual art for JPL/NASA and the aerospace industry. Craig's illustrations have appeared in many publications including Newsweek and Time magazines. In addition to his commercial work, he has participated in exhibitions at galleries and museums throughout the country and internationally, including the Fry Museum (Seattle, WA), the Arnot Museum (Elmira, NY), the Art Museum of South Texas (Corpus Christi, TX), and the Oceanside Museum (Oceanside, CA). His work is in the permanent collection of the de Young Museum (San Francisco, CA). Craig is a faculty member at ArtCenter College of Design where he has taught perspective for over 15 years.